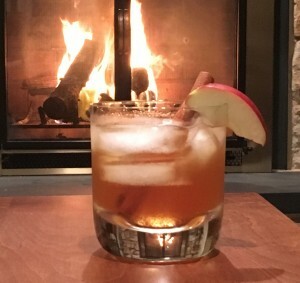 Before the Rosemary in my garden is buried in snow, I thought I would snip off a few sprigs to make this aromatic cocktail. No sour mix here – the fresh lemon juice gives this drink a nice citrusy tang. This is definitely not your grandfather’s whiskey sour. 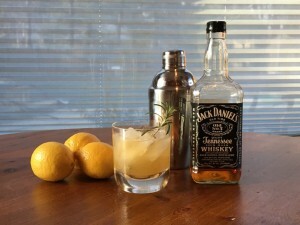 Fill a cocktail shaker with ice and add Whiskey, Rosemary Simple Syrup and Fresh Lemon Juice. Cover and shake well. Strain as you pour into an ice-filled rocks glass. Enjoy! *To make Rosemary Syrup, place 3 – 4 sprigs of Rosemary in a small saucepan. 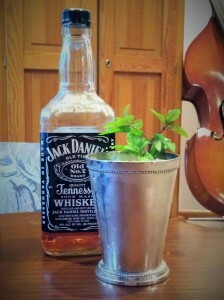 Muddle the rosemary slightly with a muddler or the back of the spoon – to release the flavor. Add ½ cup sugar and ½ cup water to the saucepan and heat on medium heat. Stir until sugar is dissolved and then simmer on low for 30 minutes. Let Syrup cool before mixing into cocktails. Store Rosemary Syrup in a tightly closed glass jar in the refrigerator for up to two weeks.